If you hear the name Hand to Hand Combat, you would hardly think it's a scratch card game but it actually is. Taking inspiration from the popular "Rock, Paper, Scissors" game, Hand to Hand Combat was created by Microgaming. It's an unusual mix of scratch cards decorated Chinese-style. It is an online game that's made up of five small rounds where you face a rival in a game of "Rock, Paper, Scissors." The goal is to grab a winning card and traditional rules apply: stone defeats scissors; scissors defeat paper and paper defeats rock. Head on over to Crazy Vegas Casino to play the game. The card denominations range from $0.50 to $10. For every position where you have to beat your opponent, you need to pay the multiplier which controls how much you'll win. It could be as much as 100x. You can scratch the panels manually using the mouse or by clicking the button that clears it automatically. 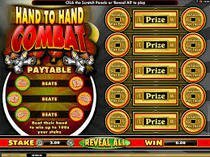 It is important to note that there are no bonuses at Hand to Hand Combat and neither is it a progressive jackpot game. The main player interface is located on the screen's right panel. Five Chinese coin-designed windows can be seen. The left side is for your opponent. On round two, you can scratch some icons of scissors, paper sand stone under fields covered by hand images. The rectangular tab has the hidden payout percentage. If the player beats his opponent, the percentage is multiplied by the rate. The pay table is also on the left side. The control panel has the following buttons: stake, new card, reveal all and win. You can mute the audio in this title. Casinos nowadays offer a variety of other online card games both on land and online. Microgaming was smart enough to merge the traditional "Rock, Paper, Scissors" game with today's technology. Although it is not that outstanding, the game is okay considering that you don't have to have any skills. It is fun and is a nice way to earn quickly. You can find the game in any casino running on Microgaming software.